► What do I do next ? Well I've built my printer, switched it on, no smoke. Pushed a few buttons and bits moved, panicked and left it overnight pushed a few more thismorning and the X n Y motors work, went round the bed springs and set a gap of 10mm from the frame and pressed the level button. It tried to bury the nozzle into the bed but I was waiting for that with a bit of thin 3ply and some tape on top. Stopped it from digging in. Couldn't figure it out at first as it has auto level but the switch would not light up unless I waved somthing below it. Took it off and found more mounting holes so I lowered it to its lowest setting. Re test and bingo it shuts the motors off. Tried the level function again and it runs all over setting itself and returns to home. Found another button Z offset ! What's this for ? Tried it and it sends the extruder to the left hand corner and runs at 45deg to the middle and stops. What I need is an idiots guide ! Re: What do I do next ? This post has no ident to say what printer, what software, etc, so more difficult to read alone. Would help even though there are other posts which part give info. Other will know "Z Offset" for sure no doubt, but I assume as a guess its the offset to adjust object "zero" height relative to bed. 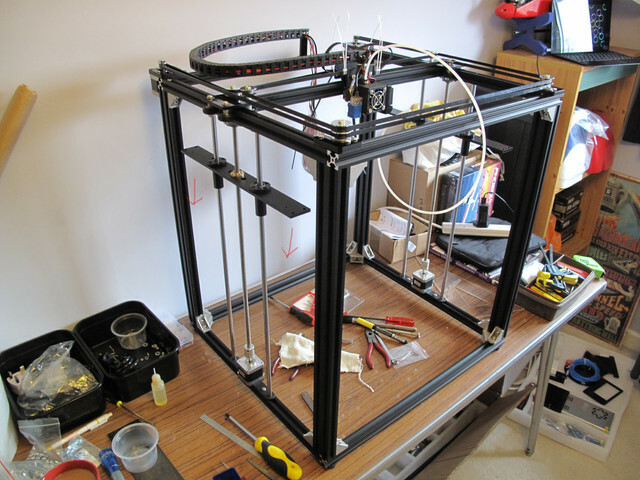 This is my printer https://www.banggood.com/TRONXY-X5SA-DIY-Aluminium-3D-Printer-330330400mm-Printing-Size-With-Updated-Touch-Screen-p-1261004.html?rmmds=search&cur_warehouse=CN the control board is a Chitu mini v5.1 with a stm32f103ze t6 chip if thats any help. I cant find much detail on the web about it. As you found, the bed level sensor needs manually lowering so it recognises the aluminium print bed before the nozzle crashes into it. Check out my review and set up guide for the tronxy x3a for more details. It's for a different TronXY printer, but the basic steps are probably the same. I did read somewhere that some types of probe don`t like glass and I just got myself a glass sheet. There's very few (if any) 3D printers that are very newbie friendly, and given you've built your printer so well Im sure you'll have it calibrated and printing well fairly quickly. My Tronxy came with an XY-08N probe, but it's also an 8mm sensor depth type and looks just like the one on your printer, so I'd guess your levelling setup will be similar to my experience. Couple of things to bare in mind; The 8mm sensor distance is probably overoptimistic and it'll be more like 6mm. 6mm will be with steel is placed beneath it (like a steel ruler). Aluminium isn't registered by the probe so easily so that'll be more like 4-5mm away. When the sensor is having to read the aluminium print bed through glass its slightly less (.3 to .5 of a mm less). I have a piece of 3mm borosilicate glass on my bed and it JUST works with my auto level sensor. The probe skims with about .75 of a mm gap above the freshly laid filament. Not much room for error when positioning the manual height of the probe and then setting the Z-offset value, but it's definitely possible (on mine at least). If you want to test the probes sensing distance and its ability to work through your glass bed just raise the nozzle to 50mm or so, grab the glass and place a metal ruler or something aluminium directly under it and then place it all under the sensor and nozzle. If the sensor lights up red before the glass hits the nozzle you'll know you're all good to use the glass you've ordered. Then it's time to place the glass on the heated print bed, lower the probe to it's lowest possible position and start the manual and z-offset calibration process. It'll take a while but it's well worth it. I,m getting the impression the level sensor don`t work with glass, trying to get the bed level I found the aluminium bed has a high spot in the middle from front to back where no adjustment screws are so I put the glass bed on and the level sensor would only work if it lowered it down past the bottom adjustment mounting holes. Its about the same dimension lowered as the thickness of the glass. I need to drill more holes or get rid of the glass or change the sensor. As it is now the nozzle is 0.3mm from the glass Do I need more room for movement ? If you place the glass with a metal object directly beneath it underneath the sensor, what's the gap measure from the probes base when the led illuminates? If you've got a mm or so it's enough. Once you know it's enough you just need to fiddle to lower its position or, worse case scenario (dependant on if your Tronxy is designed without the means to adjust the probe's vertical position enough) create some sort of bracket or drill new holes so the probe can go lower. Here's what mine looks like. The gap over the glass is approx. .75mm which is enough to clear botched (raised) filament lines and take into consideration any slight curve the glass bed may have. I was able to adjust the enclosure case (that holds the fan) in order to lower the sensor. This only lowered the fan case. It didn't lower the extruder head - and therefore not the nozzle (would have been useless if the nozzle was lowered too!) - which was attached to the X-Axis support beam. Following that I fine-adjusted the height of the probe itself. I did find I could lower the fan cover on mine so as it stands now the nozzle is 0.15mm above glass and the sensor switch just shut off at 1mm but I can still lower the switch on the 2 mounting screws. I just noticed the heater is now covered by the cooling fan shroud, I thought it was only to cover the heater body mount where the tube runs through. Is it going to be a problem possibly cooling the heater off too much ? Shoud the nozzle gap be about 5mm ? Sorry, not sure what you mean by nozzle gap of 5mm's? Regarding the fan casing: How many millimetres did you drop the fan enclosure? I'm assuming 2-3 mm's? If so it was partially covering the majority of the heater block as standard, as it was on mine. If you see my photos you'll notice my heater block is completely covered too, and I only dropped the cover a couple of mm's. It was mostly covered to start with. To be honest you'll only definitively discover whether lowering the fan & case by 2-3mm's affects the performance of the heater block through testing, but I very much doubt it'll be an issue. It may mean you have to increase the nozzles printing temp by a few degrees to achieve the same results as you'd have gotten before dropping the fan casing slightly, but I'd be surprised if it causes any real issues (it never has in my experience). Its safest to start calibrating with the nozzle about 5mm from the bed - without the glass in place. Firstly, the X Axis arm should be levelled so that's it's perfect square with the lower frame. You do this with the printer OFF with a ruler ( I use a square edge) by manually turning the Z Axis lead screws until the arm is the exact distance from the frame. This is extremely important and both ends of the X-Axis rail must end up the exact same distance from the frame on either side! 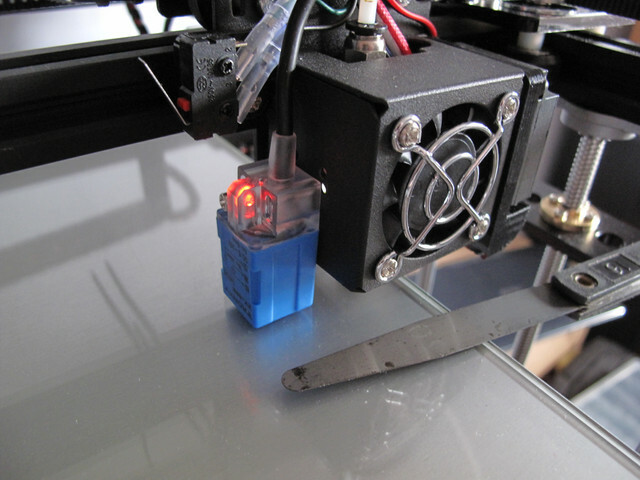 Secondly, lower the extruder via the control panel menu or by performing an 'Auto Home'. Just be sure to be prepared to turn off the printer if the nozzle touches the bed. 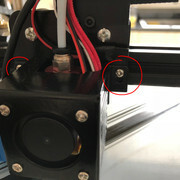 As your nozzle and printer look like they're in the correct positions (from the photo you provided) if it touches the bed either the Self Levelling Probe or Z-Offset (in the Control Panel Menu) is set wrong. Assuming it doesn't crash into the bed and stops above it, go into the Menu and Disable Stepper Motors. With the Stepper Motors disabled you can safely push the Extruder left and right across the X-Axis beam and you can push the Print Bed back and forth across the Y Axis Beam. Move the extruder to 4 corners of the print bed and adjust the springs until the distance from the nozzle is the same everywhere. Thirdly, when you select 'Auto Home' from the Menu the nozzle should stop at 4-5 millimetres from the aluminium print bed. This allows you to slip your 3mm glass sheet in place. If it doesn't have that amount of gap when you Auto Home and the glass isn't in place there must be a problem with the sensor. If it DOES have the expected 4-5mm gap, now you have to adjust the Z-offset value, which is the value that determines where the nozzle starts printing from. It's all covered in the write up I gave and it's too long to write out again. Follow the above having read through the calibration process I provided in the other thread thoroughly and you'll get it up and running. Cheers for the advise, I am going to leave it alone for now I keep finding things wrong with it. The two flat strips that secure the linear bearings and threaded drive bush are sagging at the ends. More so with the holes drilled into the flat near the centre by the bush so you can tighten the top bearing with a screwdriver don`t help. Add this to the plastic linear bearing holders allow for flex near the front and back. You only have to touch it and the settings move so your gaps all change. I might get some different bearings and maybe change the flat alloy bits for angle which would mean lots of extra work. Might also be the weight of the glass thats not helping. Firstly, what are the two large holes FOR? They must have a purpose? How is the brass threaded bush held to the plate? I would have thought that some cover/clamp would be required to hold the two positively together? (and which would fill the holes and make rigid that area. Secondly, could you not add an lightweight angle that would fit under the outer edge of the flat plate clamped to it to make that rigid and flat? (No disassembly then). It could be long enough on one angle face to use the fixing holes at ends and trimmed to fit around the bush and bearings and yet be short enough on the other face to make rigid but not get in the way? Page created in 0.066 seconds with 48 queries.